We have measured the near-field diffraction on the axis, shadow side of a perfectly conducting disk with precision an order of magnitude higher than previously available. The normally incident plane-polarized plane wave had a wavelength of 10 cm. The higher precision was obtained by use of a small, photoetched, electric probe antenna of gold on an alumina substrate with a microscopic Schottky diode at the center of the dipole detector. The small probe required a magnetron source of 10 W output at the distance of 10 m in a tapered anechoic chamber. Scans were made with 70 aluminum disks ranging in diameters from 0.04 to 2.50 wavelengths. The scans extended from the disk to a distance of two diameters. 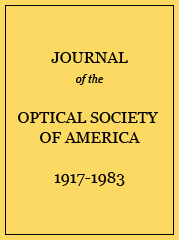 The first maximum for a resonant disk, circumference 1.1 wavelengths, and a distance from the disk of 0.65 disk diameters was |E|2/|E0|2 = 1.54. Measurement of |E|2/|E0|2 by use of precise attenuator when the detector position Z/D = 0. 5. Measurement of. |E|2/|E0|2 by use of precise attenuator when the detector position Z/D = 1. 0.